I am sorry, but save for “Jaws” and its decent sequel, “Jaws 2,” anything involving water does not equal enthralling entertainment. 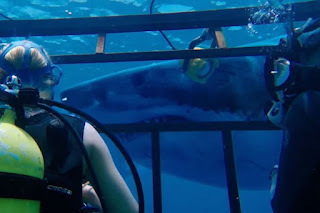 “47 Meters Down” tries to change that water myth due in part to the success of “The Shallows,” last summer which turned a suspenseful water tale into a halfway decent PG-13 suspense actioner for lead Blake Lively (“Sisterhood of Travelling Pants,” “Accepted,” “Savages”). She starred as a surfer stranded in an unnamed cove battling the elements and a great white shark, the nemesis of the movie. “47 Meters Down” follows two sisters Lisa (Mandy Moore) and Kate (Claire Holt) re-connecting after years apart. They are given a once in a lifetime opportunity to swim with the fishes (or in this case great white sharks). Also of note is actor Matthew Modine, who has been absent from the movie industry as of late. His resume runs the gamut, most notably as Private Joker in 1987’s “Full Metal Jacket.” He also supported in Jonathan Demme’s “Married to the Mob” in 1988 as well as Renny Harlin’s pirate bomb “Cutthroat Island” in 1995. This is not really a horror movie per se, but more of a suspense thriller. I would put it in the same vein as either Harlin’s “Deep Blue Sea” or Stephen Sommers’s popcorn actioner “Deep Rising” in 1998.
was a tattoo fiend just hanging out with her buddies on a spring break trip that goes awry. With “47 Meters Down,” my friend enjoyed this one quite a bit, but I am a hard person to please. I do not think it was horrible, but even the marketing is in it for the cash grab. This is not a film of substance or quality, but just here and now as a quick cash grab when students are home for the summer when they have nothing to do but spend their hard earned money. My suggestion? Go and see “Guardians of the Galaxy Vol. 2” instead or even Alex Kurtzmam’s rehash of “The Mummy” with Tom Cruise. This writer is telling you to disregard this flick and just wait for the discount house.